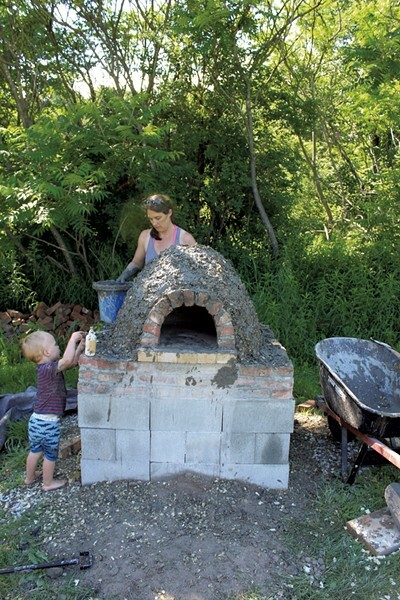 Backyard Pizza Oven | Habitat | Kids VT - small people, big ideas! 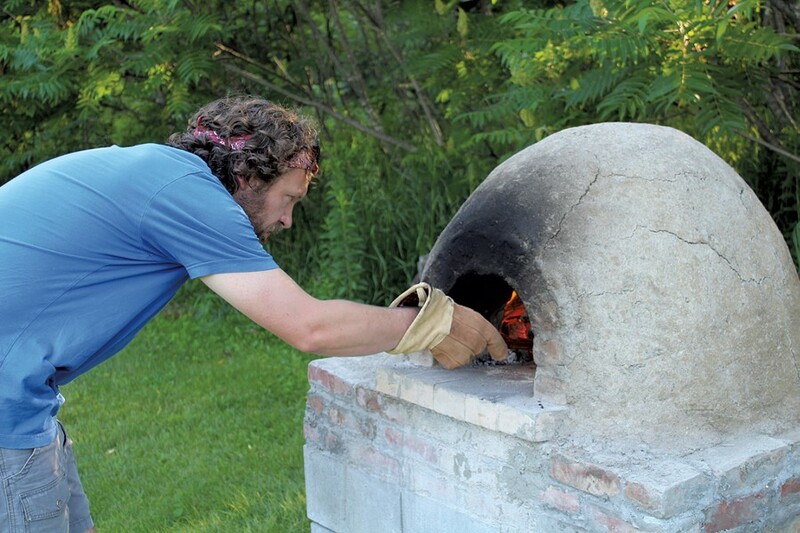 My husband, Kevin, and I talked constantly about building a wood-fired pizza oven — just like the ones at American Flatbread — when we moved to a Richmond farmhouse with a big backyard in 2010. Over the course of a few years, we've tackled several other DIY projects (patio, chicken coop) and let some dreams fall by the wayside (hot tub, dance floor). But we held on to the idea of that oven. When we got a copy of the pizza-oven bible, Build Your Own Earth Oven, we suddenly realized our dream could become a reality. We finished building our first oven right before snow fell, two winters ago. 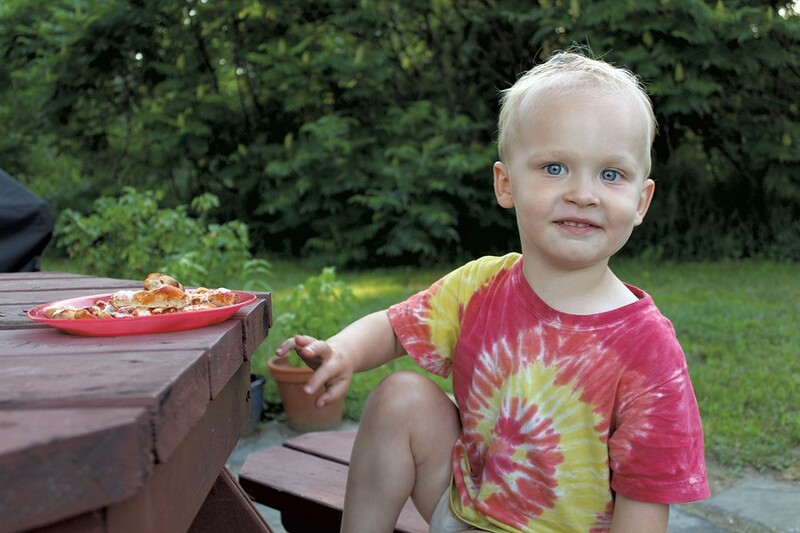 Then we had a baby — and one amazing summer with a pizza oven. The next winter, that oven collapsed, and we spent the next summer without a working oven — much to the chagrin of our pizza-loving friends. This July, we finished a second oven that, like a phoenix, rose from a pile of rubble and ash. Here's how we did it: First, we had to build a solid foundation. Since shifting turf will wreck an oven, and the frost line goes deep on our property, we dug our foundation hole five feet deep and filled it with gravel. We got the other materials we needed — bricks, cinder blocks, clay, sand, old beer bottles for insulation, pine shavings — for free or on the cheap. Front Porch Forum and Craigslist provided great leads, and some kind souls even helped load and deliver the goods. Our first attempt at a base was a brick frame filled with loose rubble. Anyone who knows anything about physics or the properties of water — like me, now — can tell you this wasn't going to last. On the second try, we stacked cinder blocks in a cube shape and filled in the holes with gravel. Then we built a short brick frame on top of that to hold in the glass bottle insulation and oven floor. Once we had a sturdy base, it was time to blend the mud for the dome. We plopped clay and sand on a tarp, sprayed it down with a garden hose, kicked off our shoes and smooshed it between our toes until it was smooth. We built a dome out of wet sand and packed the mud mixture around it to shape the oven. After that dried out and we removed the sand, we packed on another insulation layer of pine shavings coated in clay and a final layer of clay, sand and chopped hay (the same ingredients as a primitive brick). After a few sunny days and hot fires, the whole thing was dried out and ready for cooking. To prep the oven, we stoke the fire on the oven's firebrick floor and wait until the wood burns down and the oven is hot. 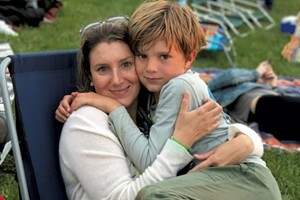 Temperatures can reach more than 1,000 degrees Fahrenheit, so kids need to keep a wide berth. When it's go time, we put on fire-resistant gloves (protect the arm hair! ), rake the hot coals over to the side and use a long-handled peel to slide the disk of prepared dough onto the bricks. Presto: In 90 seconds, pizza is ready. My 2-year-old son, Russ, is always proud to share his carefully designed pies with a bunch of hungry — and impressed — adults. When a pizza is bubbling in a backyard wood-fired oven, summer evenings take on a Field of Dreams vibe. But rather than baby-faced Ray Liotta wandering in from the back field, friends and neighbors follow the smoke. If you build it, they will come — bearing gifts of cheese, pepperoni, veggies, herbs and foraged mushrooms. Gravel came from the extremely helpful Cleary Stone Co. in Richmond. Cinder blocks and bricks for the base came from neighbors via Front Porch Forum and Craigslist. Firebricks came from Trowel Trades Supply in Colchester. Sand came from a friend and the hardware store. Clay came from a potter neighbor and from digging out a seam in the ground. Insulation came from saved glass and clean pine shavings from the chicken coop. Fiber came from chopped hay from the barn. We used Kiko Denzer's classic guide Build Your Own Earth Oven, which contains in-depth information on design and processes. When we ran into a snag not addressed in the book's FAQs, I emailed the author, and he promptly replied with suggestions and more reading recommendations. Sourcing material and learning how to work with mud took a while, but it's possible to build a small test oven in a day. Ours came together one weekend at a time over a couple of months, with lots of time dedicated to drying out the layers.